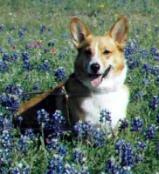 We are a small farm with a passion for breeding Pembroke Welsh Corgi Dogs. Our dogs are well bred sweat tempered little stock dogs. Our first litter in 1999 set us on the road for many more of the adorable big dog in a small package. We sell most of our pups with a limited AKC registration but on occasion we will have an individual that is DM clear, vWd clear available for full registration. We have puppies available! Call or email or Fine us on Facebook (Triple Tac Farms). Windyridges Radar At Triple Tac N.S.